Not a fan of this time of year then Gobi? Me neither. No - it was Brass Half I ran. Hamstring seems to have been beaten into submission by yesterday's run (fingers crossed. I can still feel it but not as much as yesterday morning). Should probably head to the gym this afternoon but not sure it's really sensible as I don't want to aggravate the hamstring and I still feel a bit generally achey and my stomach is still a little delicate. Ho hum, decisions, decisions. Yesterday's were "Any Dream Will Do", from Joseph and His Technicolour Dreamcoat. Lots of versions with Jason Donovan's being most well known. Why: legs will dictate how long that run is. Work first. What: upper arm and right leg workout aka crutches. So foot is now heavily strapped so it doesn't hurt! Have to be careful not to try and walk on it as it does hurt a lot when I do that! Glad you're almost better Gobi. Lyrics:Oh yes I was listening to this very song last week. Glad you are feeling better Gobi. The worst thing about crutches emzap is that they love to fall over when they are supposed to stay propped up somewhere. Tip: get a lightweight cloth bag to drap on the handle for carrying things around in when you are at home. Good the keys reappeared Wabo. WP: I generally let a plan do the thinking for my training (in the last months P & D, now P & L). Despite several years of action as I don't do my own plans but I don't like running without some sort of structure. lyrics, I feel sure I do, it keeps trying to come to me!! Gobi glad you are well on the way! WP glad y ou seem to be keeping the cold in check! Emzap Hope you are ok, have a nice day it sounds lovely!! She's a relatively new mum Wabo. Hope your back is easing. Whereas I don't like a schedule because it makes running more of a chore Hazel...........it's also very demoralising not to be able to hit the prescribed pace. Hope your work situation is a bit less frustrating. Glad to hear you're getting the better of your cold Poppy. Seals are lovely emzap. Hope you're managing ok with the crutches. Your village group seem to be very committed Dustin, it must have been going for a while now? Hope your legs are playing later Alehouse and that you don't have our weather. Well my hamstring felt better walking this morning but worse running than it did yesterday and I was very slow and had to use lots of mental energy to get my miles in. Not sure if it's the stress catching up with me, I'm on the verge of being ill or what but I'm definitely below par and finding it hard to get out of the door even though I want to run so it's not mojo or motivation that's the issue. Sounds like a combination of things exhausting you, LMH: the race may have taken more out of you than you thought, plus all the other things going on. Not sure what to suggest though! Why: the weather was foul until well after lunch (working morning only but stayed to catch up on a few things); by the time I ran it was sunny and quite pleasant. Achilles not happy though or I would have done more. I put it down to going up one pretty steep hill. Stretch later. Wabo: i hope your back eases for you and your run goes well. The rain didn't stop until about 1430hrs here Alehouse and we now have a load of surface water just as it's about to freeze..............I don't know what to do for the best either, rest usually makes me feel worse, mentally and physically so I think I'll just keep plodding on unless it gets worse. I'd rather run slow miles than no miles. Thanks Poppy, I'm sure it will pass. Glad you're feeling a bit better, em. Poppy: I'm with you. I do like to have a plan for rough guidance but after 4 miserable years of back and leg issues I've learned to listen to my body. 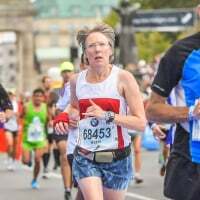 LMH - you put in a virtual 1/2 mara pb sunday, and did a long run yday. The 1/2 will kick in and make you tired on its own a few days afterwards let alone a long run too. Short and slow tomorrow !